Our site fees for evening weddings range from $6,750 to $9,950 depending on day of the week and time of year. Sattui is an incredible place to get married in the heart of the beautiful Napa Valley. It's a small family winery that's surrounded by 35 acres of vineyards. The whole place radiates energy in its amazing brick house and beautifulness during sunsets. The place is covered with so much roses and vines. It puts the vine in vineyard. Just look around at the distant red dirt and the enjoy the Napa valley. It will be a long drive so relax all you can. My son's wedding took place, and I'm needless to say that I wish my wedding was here. Just seeing your son and his wife in black and white among the backdrop of green plants, pink roses and the subtle shades of the land and sky. Their cellar was even more breathtaking. It was dimly lit, but bright near the tables. And seeing wine glasses in that kind of light setting is amazing not to mention how beautiful this place is. Reflective glass, the red napkins and red roses, the table and its dishes makes for a wonderful sight. It's like they have hired a professional in color. A wedding that goes into the night is even more amazing. They have lights strung up that seem to be specifically there to show the radiances of the green around. And if you happen to be there in the early morning. Watch the fog roll around the valley. It's a real sight. You never thought fog could be so nice. 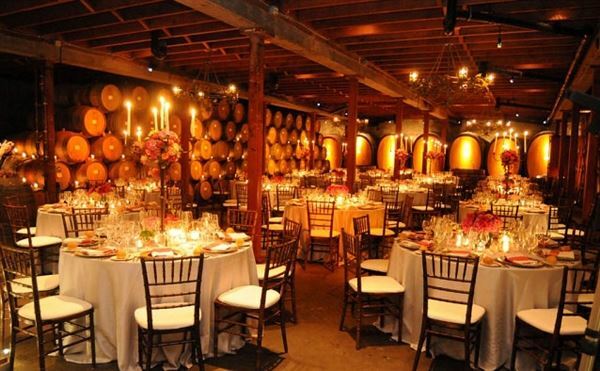 V. Sattui is a wonderful place and getting married here will really be an event to remember.